Do You Remember... "Hopalong Cassidy"
Hoppymania swept the nation in 1948 when William Boyd, having secured all rights to the 66 Paramount and U.A. Cassidy westerns, took a gamble on the new medium of television. The gamble paid off—richly—and Hopalong Cassidy became an all new TV hero to a generation of kids who’d not seen the films during their original theatrical release. Boyd found himself a millionaire overnight, quickly licensing thousands of products with his image and the Hoppy moniker. Boyd and his longtime movie sidekick, Andy Clyde, starred on the “Hopalong Cassidy” radio show, heard first on Mutual and later over CBS (Jan. ‘50-Dec. ‘52). After a few years of nonstop TV exposure, Boyd figured it was time to go back into production, this time with a half hour TV series. 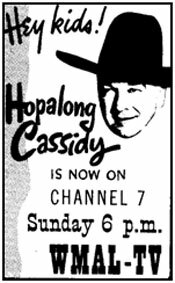 To the well remembered introductory musical strains of, “Here he comes, Here he comes…”, 26 episodes of “Hopalong Cassidy” were broadcast on NBC for the ‘52-‘53 season, with the first 12 being nothing more than the last 12 Boyd-produced U.A. films edited down to 27 minutes, supplemented by new voice over narration to bridge the gaps in storylines. In actuality, many of the slow moving films played better at this length than at their uncut 60 minutes. The budget conscious Boyd now needed to only produce 14 new episodes for the first season. Again for budgetary reasons, Boyd eliminated the youthful sidekick and replaced Andy Clyde with a lesser salaried Edgar Buchanan (1903-1979) as grouchy, grumpy Red Connors. Boyd later saw the error in his decision and tried to rehire Clyde, however Clyde, still hurt by Boyd’s earlier decision, now refused Boyd’s offer. The series was made on the cheap, with few extras and action sequences at a minimum. 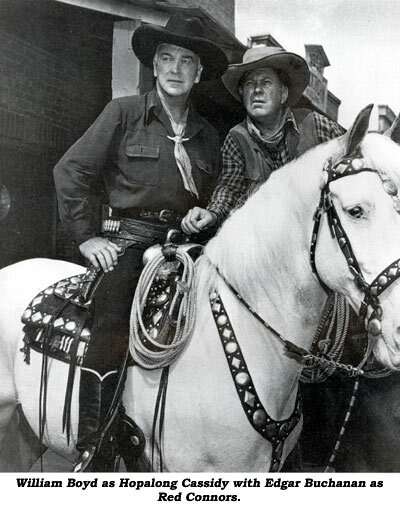 Many episodes featured an abundance of Boyd voice-over narration while he and Buchanan rode the trail. Stories revolved around Hoppy’s Bar-20 and the town of Twin Rivers where Hoppy was Sheriff or Marshal in many episodes. The first season scripts were all (save one) by either Harrison Jacobs or Sherman Lowe, both veteran western screenwriters. 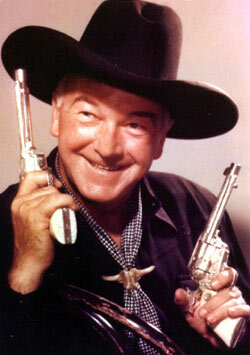 Jacobs had worked on 13 early Hoppy features including “Hopalong Cassidy Returns”, “Santa Fe Marshal” and “Borderland”. Lowe had contributed scripts to various studios for Rex Bell, Gene Autry, Johnny Mack Brown and Charles Starrett. Second season (‘53-‘54) scripts came from a wider variety of writers including such pros as Ande Lamb, William Lively and J. Benton Cheney. Supervising the editing on all the newly filmed half hours was Fred Berger, who’d performed the same job on Cassidy features since 1943. Raoul Krausharr scored the background music (or at least recycled themes he’d previously written for the last 12 Hoppy features and earlier Republic titles). Boyd also reached into Hoppy’s past for directors on the TV series—Derwin Abbe (aka Derwin Abrahams) and George Archainbaud. The newcomer was Thomas Carr who’d not worked on Cassidy pictures but had helmed plenty of westerns. The casts were strongly rooted in B-western veterans—Glenn Strange, Lane Bradford, Rick Vallin, Denver Pyle, Pierce Lyden, Lyle Talbot, Don Harvey, Claudia Barrett, Myron Healey, Harry Lauter, William Fawcett, Nan Leslie, Duane Grey (Thorsen), Tom Keene, Clayton Moore, Elaine Riley and others. Melody Ranch and Walker Ranch were most often utilized for location shooting.